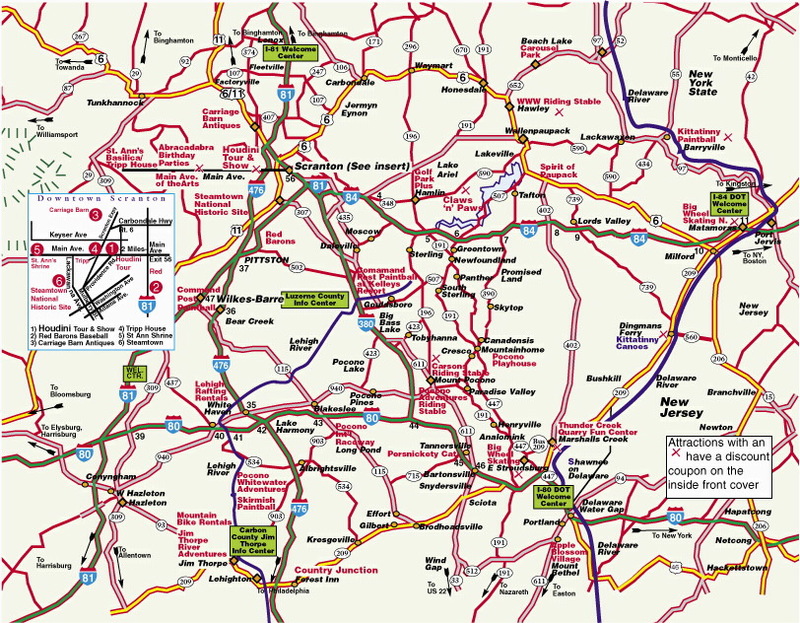 Poconos Mountains Map Hotels-motels-campgrounds-couples resorts. Poconos Pocono Mountains Scranton Wilkes Barre Pennsylvania family tourist vacation Map. This site has information on Pocono Mountain, Poconos Mountains lodging, B&B's, Bed & Breakfast's, hotels, motels, rooms, camps, campgrounds, in NE PA Pennsylvania (PA). towns covered include Analomink, Bartonsville, Bushkill, Bushkill Falls, Delaware Water Gap, Dingmans Ferry, E. Stroudsburg, Marshalls Creek, Mt Pocono, Pecks Pond, Pocono Manor, Portland, Scotia, Scotrun, Shawnee, Stroudsburg, Swiftwater, Tannersville; Blakeslee, Dallas, Drums, Elysburg (West of Poconos), Hazleton, Jim Thorpe, Lake Harmony, Lansford, Lehighton, Palmerton, Pittston, Pocono Lake, Pocono Pines, Wapwallopen, West Hazleton, White Haven, Wilkes-Barre; Barryville, Beach Lake, Canadensis, Cresco, Greentown, Hamlin, Lake Ariel, Hawley, Honesdale, Lackawaxen, Lakeville, Matamoras, Milford, Mountainhome, New Foundland, Shohola, Skytop, Tafton, Wallenpaupack, White Mills;Carbondale, Clarks Summit, Dalton, Dickson City, Dunmore, Eynon, Factoryville, Gibson, Gouldsboro, Harford, Lenox, Meshoppen, Moosic, New Milford, Nicholson, Sayre, Scranton, Starlight, Tobyhanna, Tunkhannock, Uniondale, Waymart with links to free discount coupons, reservations, restaurants, dining, theaters, attractions for visitors traveling on vacation to our area. New!!! We can make your Pocono mountains hotel reservations and help you make your choices. Honeymoon & romantic getaway packages as well. Just fill out the form with phone number and dates. No Obligation. CLICK HERE NOW! Businesses do not pay to be in this guide. Listing is free of all charges. © by GuestMagazine.com.No part of any of this document may be reproduced in any form, without written permission. The graphics have been retouched, computer enhanced and resized by the authors.